Master Sculptor Lei Yixin and Harry Johnson. The thousands of visitors at the Martin Luther King Jr. Memorial in Washington this week will reflect on the controversial likeness of the man, his legacy and the significance of the first nonpresident — and first African-American — immortalized on the National Mall. But most of them probably won't know who built it. They will find little about the pivotal role played by the African-American fraternity to which King belonged, Alpha Phi Alpha. The organization is more than a century old but largely unknown to nonblacks, and had no experience with a project of this magnitude. "This is far-fetched," says Alpha Phi Alpha president Herman "Skip" Mason Jr. "I mean, come on." INTERACTIVE TIMELINE Off The Ground: Creating The Martin Luther King Jr. Memorial The idea was born in 1983 at the dining table of the late Alpha brother George Sealy. Over the next three decades, the fraternity battled government commissions over location and design, raised about $112 million in a single six-year span and generally led a public campaign to justify why King deserved a place in the most exclusive section of the National Mall, alongside shrines to Abraham Lincoln, Thomas Jefferson and Franklin Delano Roosevelt. Alpha Phi Alpha won't be at all lost in the week's worth of festivities to dedicate the monument. Several of King's top lieutenants from the 1960s also are Alphas, and they are scheduled to be honored at numerous events. They include civil rights icons such as former U.N. Ambassador Andrew Young and the Revs. Joseph Lowery and C.T. Vivian. While the fraternity itself may hold little name recognition in mainstream America, many of its members are major power brokers in their professions and used their influence to raise money, push legislation through Congress, and design and build the project. They include several members of Congress and executives at General Motors, Toyota and McDonald's — including the fast-food chain's president and chief operating officer, Don Thompson. Don't see this as an African-American project. Don't see Dr. King as an African-American hero. See him as an American hero. Where would you place an American hero? Mason said they helped clear a number of obstacles along the way — and there were plenty. The project was denied its first choice of location, until Alphas in Congress "applied political pressure," he says, to reverse the decision and allow the memorial at the Tidal Basin. They calmed anger over the selection of Chinese sculptor Lei Yixin, against demands that an African-American be given the job. And when fundraising was at a trickle in the early 2000s (with only about $2 million collected solely from fraternity members), they devised a strategy that extracted commitments from many of the top U.S. corporations. When their building permit was held up, they helped secure a $12.5 million letter of credit from Wal-Mart to break ground. They also put aside the age-old rivalries with fellow black fraternities and sororities to raise a total of about $1 million from those groups. "I suppose we could beat our chests, but this was truly a total family effort from all our brothers and from the Divine Nine — the other black Greek organizations," Mason says. Corey Dade: Plenty of big ideas have come from "kitchen cabinet" pow-wows — or from a dining table, in this case. But a national monument? How did the fraternity brothers arrive at it? Harry E. Johnson Sr.: They thought we needed to have more people of color visit the National Mall. So in thinking about that, they felt the best way to have people of color visit was to have a person of color on the Mall. Quite naturally the name they came up with was Dr. Martin Luther King Jr.
Dade: Did they choose King because of his legacy in civil rights, or also because he was a member of Alpha Phi Alpha? Johnson: I would say for both reasons. They looked at a memorial for [civil rights activists] Rosa Parks or Dorothy Height. The first concept of the Martin Luther King memorial was actually comprised of having panels to each of the civil rights leaders. ... King was certainly the focal [point], but it was about honoring African-Americans, in general. But [in the end] the National Park Service said the bill authorizing it was for Dr. King, so it has to be only about Dr. King. Dade: How much did they estimate the project would cost? About Alpha Phi Alpha Alpha Phi Alpha Fraternity Inc. was founded in 1906 at Cornell University, becoming the first Greek-letter organization established by African-Americans. Today, the group counts more than 125,000 members. Legendary Alphas include Martin Luther King Jr.; W.E.B. Du Bois, co-founder of the NAACP and a "father" of modern sociology; jazz composer Duke Ellington; and former Supreme Court Justice Thurgood Marshall. Today's prominent members include Rep. Emanuel Cleaver (D-MO), chairman of the Congressional Black Caucus; CNN contributor Roland Martin; and Princeton professor and author Cornel West. Johnson: Early on, those six visionaries thought this would be a million-dollar project. It wasn't until after you got the land and then the design that you were able to put an actual price tag on this. Dade: Just $1 million? If they were only correct. Johnson: I wish they were. We'd have been done years ago. Dade: You wanted to put the memorial at the Tidal Basin on a plot of land known by the government as Area 1. But your proposal was initially rejected. Tell me about that. Johnson: We had to deal with three different [governing] bodies. ... They had their own ideas about where they wanted this to go. Their original idea was that it needs to be built over near RFK Stadium and [the neighborhood of] Anacostia. They said because that's where the National Mall is going to go. We said, "Yes, in 100 years." So we had to fight and say, "Here's why we need to be in Area 1." Dade: Why did you want the memorial on the Tidal Basin, or Area 1? Johnson: There are statues all over D.C., but Area 1 is where you have the Jefferson and Lincoln, the George Washington memorials and all the major memorials. We felt from day one that Dr. King was of that ilk. We felt that Dr. King was a change agent for this country and that he was a hero at the same level. Dade: Of course, the National Capital Planning Commission reversed itself and approved your original site proposal at the Tidal Basin. What led to this? Johnson: Again, by just trying to make our case. Don't see this as an African-American project. Don't see Dr. King as an African-American hero. See him as an American hero. Where would you place an American hero? Dade: By 2001, when you took over as president of Alpha Phi Alpha, how much money had been raised? Johnson: About $1.5 to $2 million. General Motors had come onboard with a promise of $10 million. Tommy Hilfiger had come onboard with a promise of $5 million. But no commitments from any of those organizations. It was just the early stages of, "We're thinking about it." So, just a couple million from Alpha Phi Alpha. Dade: You had significant obstacles to overcome in winning over potential donors. You represented a fraternity largely unknown among nonblacks that had no record of completing a project of this scale. And you asked them to support a memorial for a man who obviously represents one of the most turbulent, divisive and violent periods of U.S. history. So, what was your pitch? Johnson: You're not going in for a handout. You're saying, "This is something you should consider supporting." If they said no, then we told them why they should support it: "You really should do this because it's the right thing to do." And we told them that this [money] isn't for an African-American project; this is for something that benefits the whole country. Dade: Not an African-American project? Johnson: While Dr. King was African-American and many of us running this [foundation] are African-American, we see this as a gift to the country for all Americans. We see it as a gift to the world, for people from all over the globe to see the great diversity of our country. Dade: Wasn't there was some concern that you might not finish this project? Johnson: Sure. It's the same issue that everybody building a memorial has to address. The World War II, the FDR memorials. Dade: What was the goal of the design? Johnson: The goal of the design is for you to be invited in. The second goal is that, as you pass through what we call the Mountain of Despair — two large boulders of granite, 30 feet tall — it appears as though you're going through a struggle of the civil rights movement. Once you're on the other side, you see a crescent-shaped wall with 14 quotations from Dr. King. Then when you walk out toward the Tidal Basin, you see the third stone — one that looks like it was carved out of the Mountain of Despair. 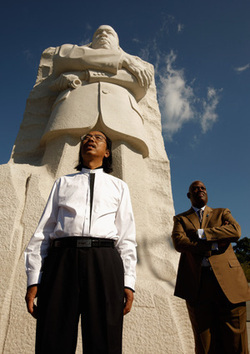 And Dr. King is standing there, and we call that the Stone of Hope. The ultimate goal is for visitors to come and see and feel what Dr. King really meant to this country and, indeed, the world.